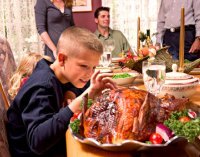 A traditional Thanksgiving dinner can easily contain 1,500 calories or more (that’s just one person’s plate; not the entire table). But there are plenty of ways to cut down the amount of calories in your holiday feast without sacrificing flavor or enjoyment. Start by filling half of your plate with vegetables. Choose the ones without creamy sauces or sweeteners. Green beans, broccoli, asparagus, cauliflower, corn, carrots and raw salad are great starters. The next quarter of your plate can be filled with protein like turkey or fish. The last quarter of the plate can contain small portions of the richer, more fattening foods like stuffing, yams with marshmallow, mashed potatoes, and the like. You can add a small amount of gravy to taste if you like, but avoid pouring it on too heavily. Check out this printable visual of how to portion out your plate: Portion Plate. By the way, this is the same kind of worksheet used in my online nutrition coaching program. Learn more about online nutrition coaching. When you start eating, begin with the vegetables that fill half of your plate. Once those are gone, then move on to the richer foods. This helps you feel full and satisfied before you begin eating the high calorie foods. If possible, drink a glass of water before sitting down for your meal, and then keep sipping more water as you eat. It definitely helps you feel fuller, which means you’ll eat less than you otherwise would. Eat slowly, chewing eat bite completely. Enjoy the rich flavor of each food, and pause between bites for a few moments. Enjoy the company of the people you’re eating with. Have fun, laugh, swap entertaining stories - it’s not all about the food. 2 thumbs of fat dense foods. 1 thumb of fat dense foods. Download and print the guide here: Hand-Sized Portion Guide. 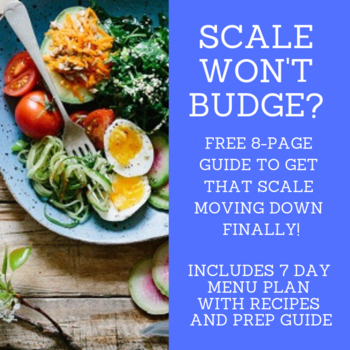 Following these simple steps should help you keep your overall calorie intake lower than you normally would - and you’ll still have room to enjoy a small dessert afterward.